WOW! That thing is HUGE!!!! It’s actually very pretty. What kind of beast, I mean spider, is that? It IS big and creepy!! She’s beautiful! I’m so proud of you for getting that picture. Just FYI, she’s an orb weaving spider. That means she builds the halloween or “Charlotte’s Web” type web. She builds a new one every day, and the spokes on the web aren’t sticky. Only the parts that go in circles. 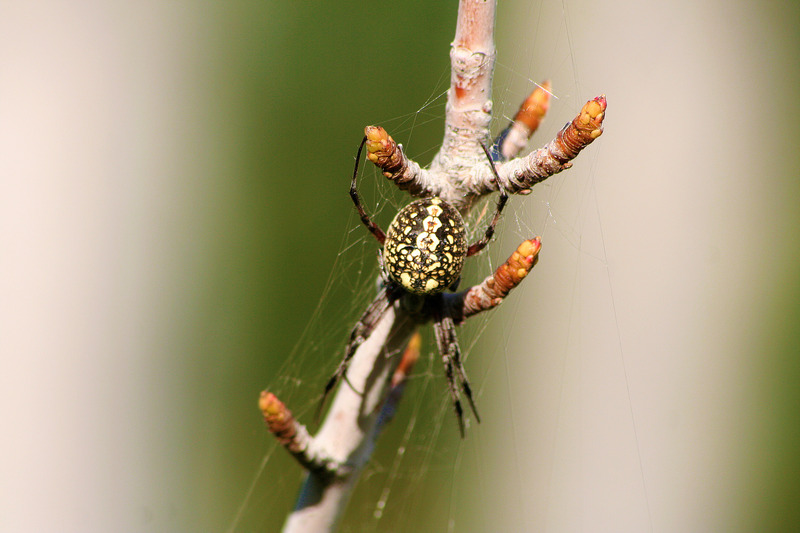 If you want just a bit more information, she is technically a Marbled Orb Weaving spider. I bet you can guess why. Her abdomen looks like a beautiful marble. She will capture about any insect that blunders into her web. Mosquitoes are a favorite. If damage is done to her web by an insect too large to capture, she releases the insect and repairs the web as best she can. Interesting info from CeeCee but they still creep me out. Nice shot. Congratulations, Justina! You have begun to conquer your fear.